We love soups for chilly autumn evenings just as much as we love cozy cashmere sweaters and plaid scarves for braving the elements. We want to share this astoundingly delicious, fragrant and colorful recipe from Saveur magazine. 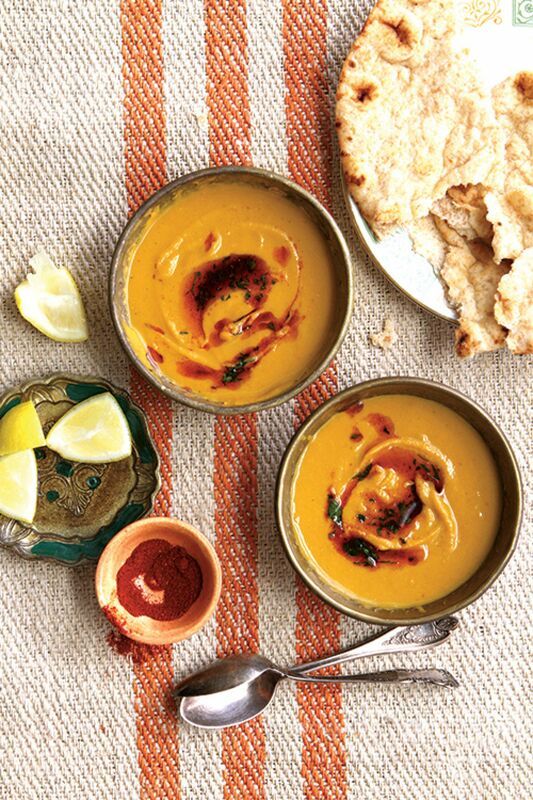 Serve this red lentil and butternut squash soup with flatbread and enjoy! Heat oil in a 6-qt. saucepan over medium-high heat. Add garlic, carrots, celery, and onion; cook, stirring occasionally, until slightly caramelized, 12–14 minutes. Stir in cumin, chile flakes, squash, salt, and pepper; cook until squash is soft, about 15 minutes. Add stock and lentils; bring to a boil. Reduce heat to medium-low; cook, slightly covered, until lentils are very tender, about 20 minutes. Let soup cool slightly, then, working in batches, purée soup until smooth. Ladle soup into bowls and garnish with parsley and paprika; serve with flatbread and lemon wedges on the side.